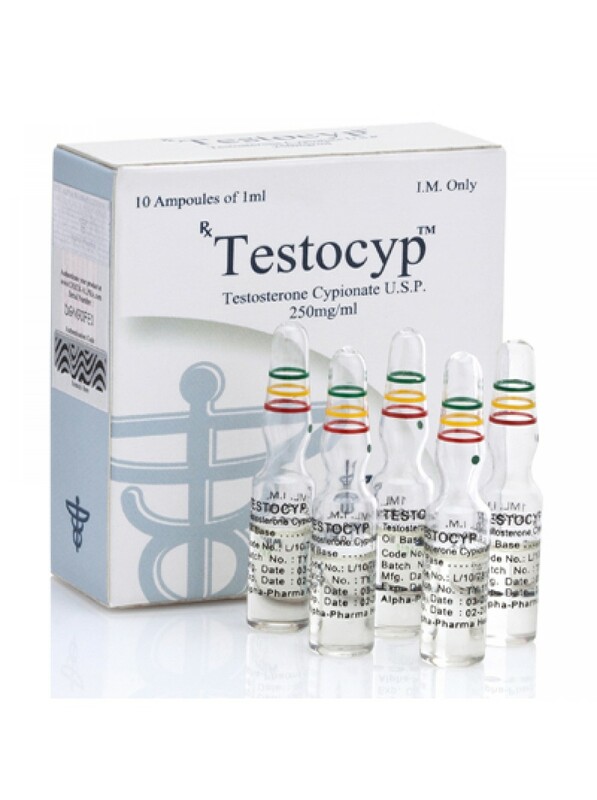 Alpha-Pharma Testocyp vial is known for its long half-life, compared to testosterone of a different composition. This is the so-called long ether. Half-life occurs 15-16 days, which causes an abundance of water in the muscles. It works well on joints, helping to prevent injuries in athletes. Alpha-Pharma Testocyp bodybuilders are used to increase muscle volume, about thirty percent of which is water. Since such a rollback is considered minor, this is not a reason to worry. If you combine the course correctly, the rollback will be minimal. Alpha-Pharma Testocyp is a drug created on the basis of testosterone esters with a long lasting effect. Thus, the half-life of the molecules of the active substance, in the blood plasma of an athlete, can reach 15-16 days. However, in addition to the well-known positive moment, from such a long period of stay of the substance in the blood, there may be some side effect – fluid retention in the tissues, which entails puffiness and a very significant rollback phenomenon, which manifests itself at the end of the reception. Alpha-Pharma Testocyp injections are recommended at least once a week. It helps to keep the concentration of the substance in the blood constantly high. To accelerate weight gain, due to muscle growth, it is necessary to limit one-time dosage equal to 250-500 mg. Despite the fact that taking the drug in a volume of from 800 to 1000 mg. per week can increase the effectiveness of the course, at times, the excess of the recommended upper rate of 500 mg., nevertheless, undesirable. Alpha-Pharma Testocyp, in case of overdose, can cause a number of side effects. To eliminate them, starting from the second week of the course, tamoxifen is applied in a volume of 10 mg. per day. Also, at the end of the steroid intake, a course of restorative therapy is carried out using ProViron.